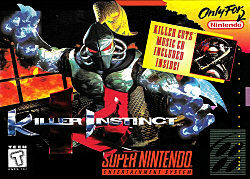 Killer Instinct is a fighting game developed by Rare and published by Midway and Nintendo. It was released as an arcade game in 1994. The game's plot involves an all-powerful corporation called Ultratech organizing a fighting tournament. The story was adapted in a limited comic book series published under the short-lived Acclaim Comics imprint. Killer Instinct features several gameplay elements unique to fighting games of the time. Instead of fighting enemies in best-of-three rounds bouts, each player has two life bars. The player that depletes the other player's life bars first wins the match. The game also introduced "auto-seconds", which allows players to press a certain sequence of buttons to make characters automatically perform combos on opponents. Also featured in the game are "combo breakers"; special moves that can interrupt combos. The Capcom Fighting Network Beta has gone live as the studio pledges to right Street Fighter V's wrongs; it's just too bad that they're already starting it off on the wrong foot. EVO is the largest fighting game tournament in the world. Here's 4 reasons why it's worth the trip to go as a spectator. With EVO 2016 approaching we take a look at one of the world's largest eSports tournaments and what makes it tick. This hulking behemoth and his razor-edged knife are the latest piece of DLC content on the horizon for Season 3. The least spooky, scary skeletons one can imagine. Battletoads' Rash joins the Killer Instinct lineup in preparation for Season 3 coming in March 2016. Further proof of Battletoads revival? Don't want to miss the grand finals of your favorite game at EVO 2015? Check the time slots here! Reggie Fils-Aime acknowledges that the PS4 and Xbox One have exclusives, but there's way more shared content. He defends the Wii U's exclusive lineup. Old favorites return for this upcoming season of Killer Instinct. Former eSports manager Zach Wigal explains how Gamers for Giving is helping kids in hospitals get their minds off being sick. Xbox One kicked players out of a Killer Instinct match during a tournament to ask them to prove they owned the game... while they were streaming. Looks like PS4 players are stuck on pad for fighting games for the foreseeable future. One of two white Xbox Ones has recently sold in the United States for $11,300 in a auction for the Wounded Warrior Project. The early reviews are in, and the Xbox One launch titles are scoring both lower and higher than the PlayStation 4. Killer Instinct Season 3 featuring Battletoads. Hints at new game? What is EVO: the Evolution Championship Series? No one has reviewed Killer Instinct yet! Played Killer Instinct yet? What did you think?